Why did you decide to join the Word N Sound Poetry League this season and did it meet your expectations? I have been meaning to join Word N Sound for some time now, reason being is to challenge myself, push myself and see my slamming capabilities! This is my first time slamming so religiously. It has reached my personal expectations. How would you describe your journey on the Word N Sound stage this year? I would describe it as a roller coaster ride, with highs and lows. 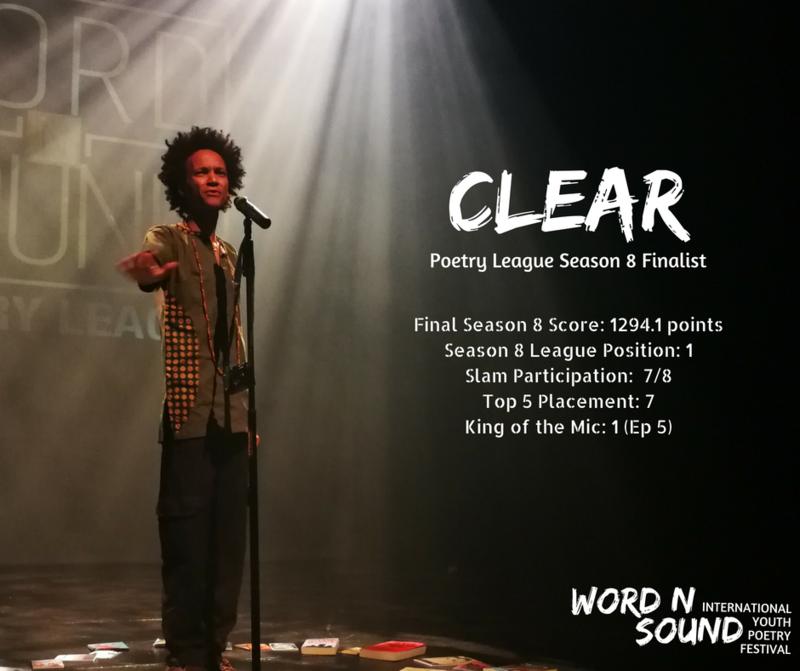 The level of poetry and competition that takes place at Word n Sound can be straining yet rewarding at the same time. Which two of your performances have stood out for you and why? First the one in May, the poem about churches titled Heaven’s Hell. I can’t remember which month was that and the one in June, performing “food for thought” the month which I became king of the mic. What has been the biggest challenge you have had to overcome? 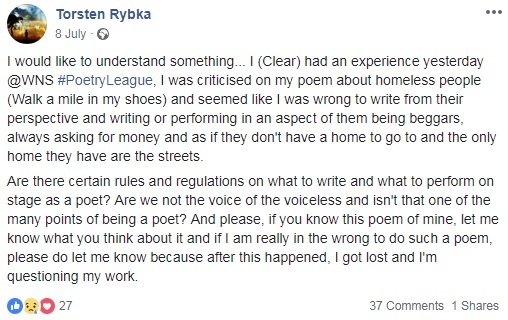 To overcome to criticism I received from people, about me reciting the poem about homeless people in first person. I was being bashed and told it was wrong to do so, even if I did my research. The Poetry League can at times be tough, who has helped you along the journey and kept you coming back each month? 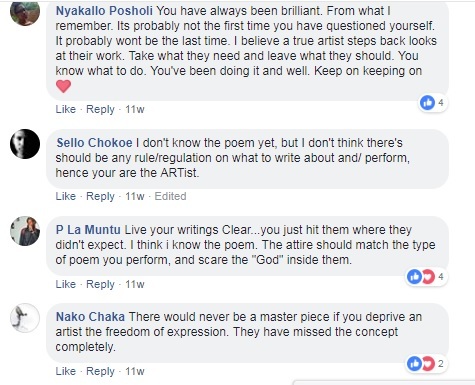 Fellow poets who have been slamming, most of those that have been in the top ten slamming (Masai, Soetry, Keneliwe, Dr Linda, Met A Morphosis, etc) they have been giving me pointers and as well, help me overcome the issue of the homeless person poem. Going into the finale, who would you say is your toughest competitor and why? Every one that is in the finale, you can never know, cause these brothers have been on their A game and can pull a rabbit out of the hat, so I have to be on my toes for this finale. What have you learnt from the other competitors this season? Never take this slam nor Word n Sound lightly, anything can happen and it’s always unpredictable. One has to always be sharp, on point and always stand out from the rest. Who has been your favourite poet to watch this season? 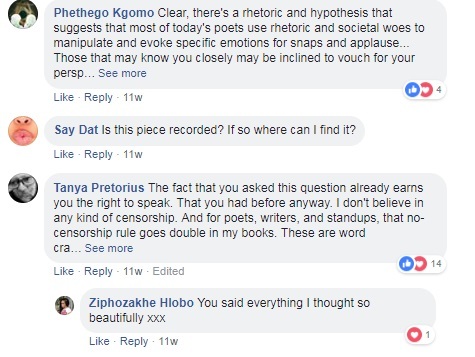 I don’t have a specific poet, that I could say is the one that been pulling out the stops, all of the poets have been pushing themselves and doing their best. Season 8 of the Poetry League will come to an end on Sat 6 Oct at the finale. Find out more about the event and get your tickets here. 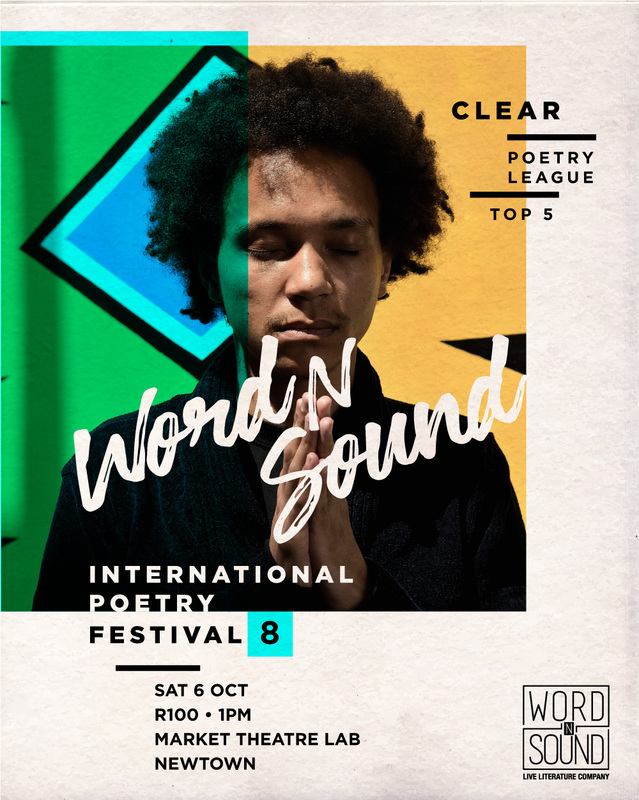 The 8th Word N Sound International Youth Poetry Festival runs from 3 – 7 Oct 20018, find out more here.